This is an interesting four sided card, which opens up like a book. The top image represents the "inside" view and the bottom image would be the front and back "cover". 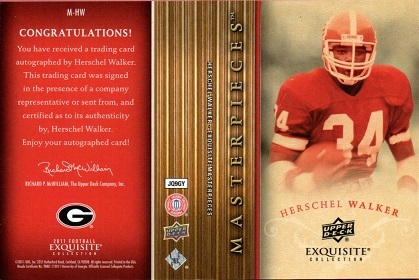 The Masterpieces set was part of Upper Deck's 2011 Exquisite line. It was an 18 card set of college football legends. Each card features an image of a painting of the player in a frame, along with an autograph. The Walker cards are serial numbered to 25, with this example being #8. 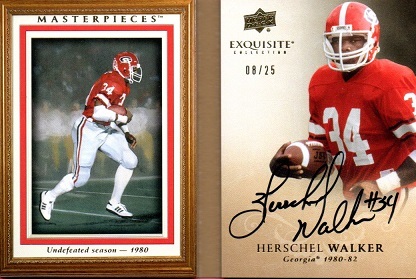 I'm pleased to add this card to the Herschel Hoard.